Another day, another event at the Commonwealth Games. On Sunday, Clare and I attended the final session of the Rugby Sevens at Ibrox, where the medals were dished out. In the end, gold went to South Africa, who shocked New Zealand 17-12 in the final. The All Blacks’ defeat was their first in 5 editions of Sevens at the Games. The Springboks completely deserved their victory, however, playing some wonderful running rugby throughout a match that at times verged on the brutal. In the bronze medal play-off meanwhile, one of many crowd favourites Samoa lost to Australia by 24 points to nil. What of the home nations? All three had been knocked out in the quarter finals earlier in the day, and as such were contesting the Plate competition in the evening. 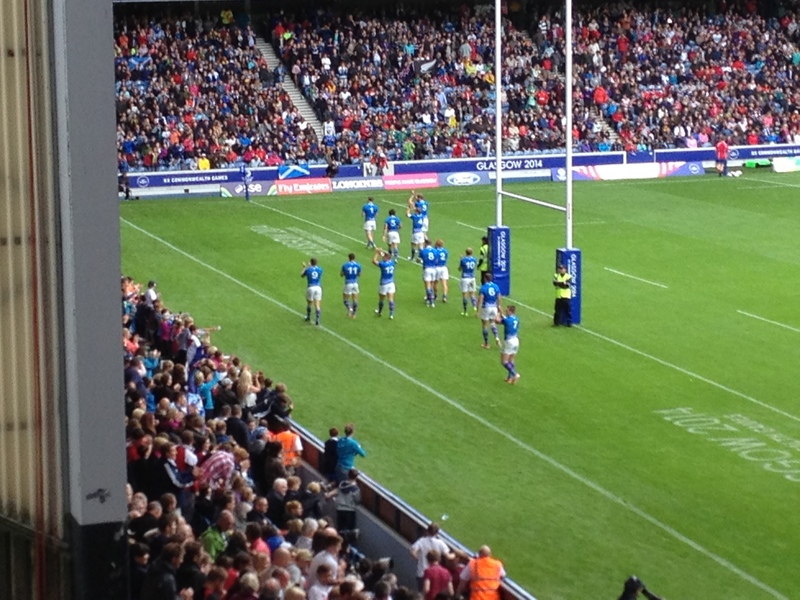 Scotland, having lost to South Africa, faced England, whom Samoa had snuck past in the quarters. The first half seemed to draw many similarities between the Sevens side and the Scotland XV – lack of penetration in attack coupled with silly errors in defence left Scotland 15-0 down at the break. During the two minutes, compere Des Clarke (who was very good despite my being determined to dislike him) led the 50,000-strong crowd in a I’m Gonna Be (500 Miles) singalong. The desired response came in the second half, but not quite enough of one. 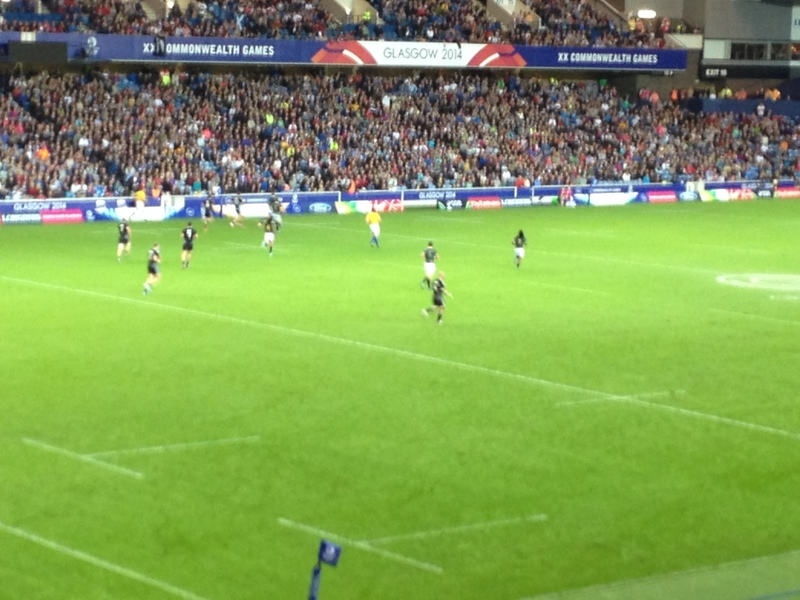 Scotland scored two fantastic tries in the second seven minutes to reduce arrears to 15-12. The hooter went with the ball still in play, and Stuart Hogg found a gap and ran for the line. Ibrox rose to roar him over the line… except he came up just short, England turned the ball over and booted it out of play to end the game. The home seven were devastated, as were the majority of the Ibrox crowd. Wales then played England in the plate final, losing to a final second try from the English who took the plate and thus fifth place. The other undoubted highlight of the day was getting to see the previous afternoon’s crowd favourite, the mighty Uganda side. Although they were hammered 32-0 in their bowl semi-final against Canada, the crowd was again completely behind them. A Sevens tradition I wasn’t aware of, and really enjoyed, is that once a side is knocked out, they do a lap of honour of the stadium. Unsurprisingly, the Ugandans were given an absolutely thunderous cheerio from the crowd for their lap, particularly when they did “Klinsmann” dives at the Broomloan Road end on their way round. My only gripe would be the legroom in the Main Stand at Ibrox. For a ticket that was supposedly the second most expensive, I had to sit either with my knees jammed against the seat in front, or go for a one leg squinting out the way to stretch it a bit. Either way, I have a modicum of sympathy with any Rangers supporter who has to pay £600 for a season ticket in the seat I was in. In all though, another fantastic day of sport in front of a raucous and generous crowd. The atmosphere started on a high, was kept well stoked by Mr Clarke and then reached a crescendo with the final. Certainly rather different from the usual Ibrox experience. 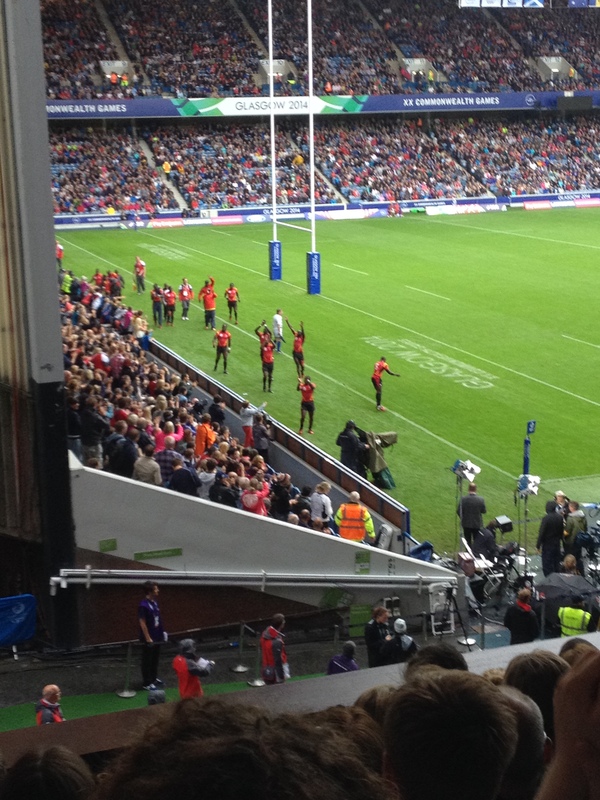 As well as the Ugandans, the crowd got right behind any side it determined was an underdog in a particular match – the Cook Islands and Samoa were also well supported. 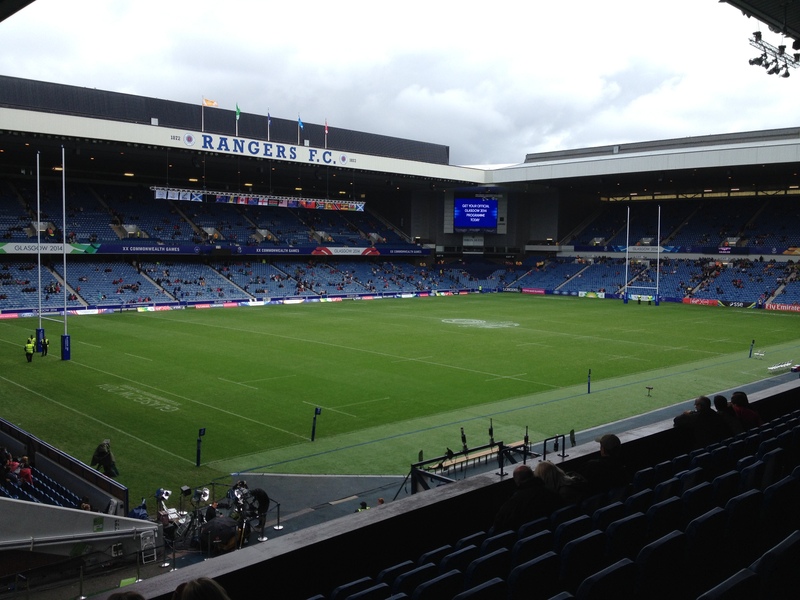 There is talk of the Scotstoun 7s being relocated to Ibrox in the next few years. 170,000 people through Ibrox in four sessions suggests there may well be an appetite for that.